This 91-year-old lady with dementia was left in this state, amongst broken glass, when the driver returning her from her daycare centre broke in, as there was no-one home to receive her. He had dropped her off early; her daughter came back (early) a few minutes after this occurred. It has been impossible for the daughter to get her complaint about this dealt with by the various authorities. 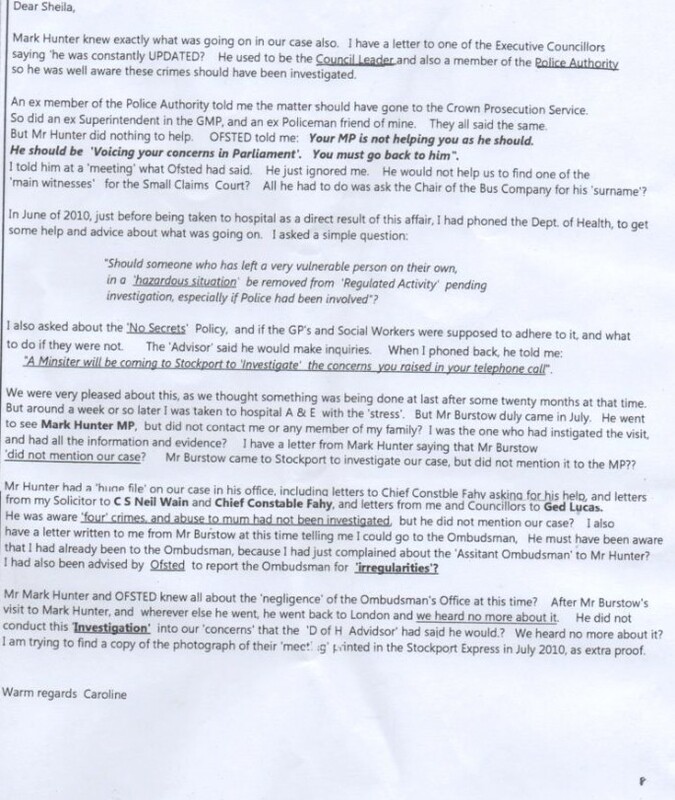 This is so often the case in Stockport; no matter how serious the incident complaints are stone-walled. Will the driver do this to other vulnerable people in the future? I hope not, but who knows? Click opposite to view Caroline Blood's website. "Mother and I went to the Police Station on 16th September 2008 with photographs to report a crime. The Police told us it was breaking and entering. It was not investigated and the perpetrator was not brought to account. The driver of the vehicle had been nearly an hour before the usual time. After shouting: "I am going to break her door down" in front of a terrified 91 year old with dementia, he then took her back across the road and smashed the door with her handbag, with key still inside it, and then drove off leaving her in shock in a roomful of broken glass. They Police apparently told this driver and his company that they had done nothing wrong. We challenged that ludicrous decision, as any right minded person would. We were then broken into a further two times. The Inspector said it was intimidation. They found a fingerprint and according to the man from forensics and excellent footprint on the sideboard. They did not follow up on the investigation. The Council would not investigate. A 'Safeguarding Investigation' or indeed any kind of investigation was 'not deemed appropriate'. 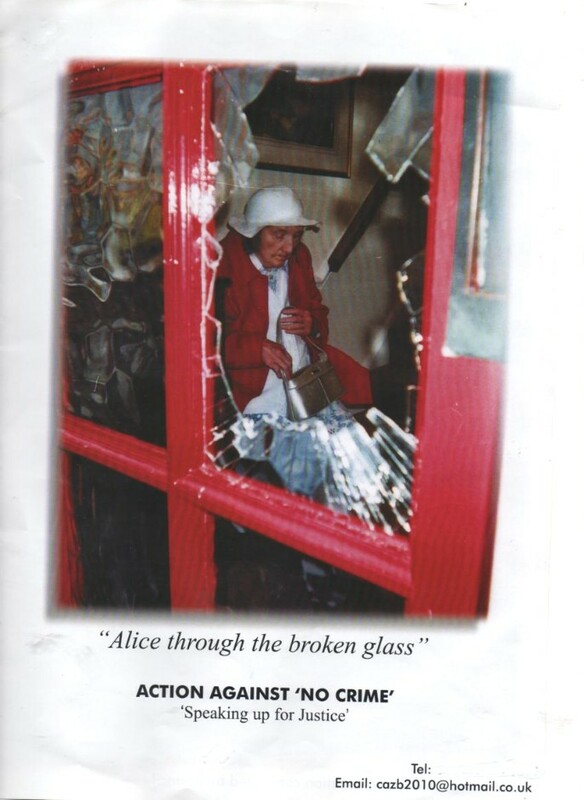 To this day, unbelievable as it sounds, the driver of the first crime (see photo of Alice through the Broken Glass) has never been interviewed by anyone from the Social Services." Letter about this case published in a national newspaper.